My latest quilting project is actually six years old--a quilt top I finished in 2012--a calendar quilt--with the 12 blocks representing each month of the year. 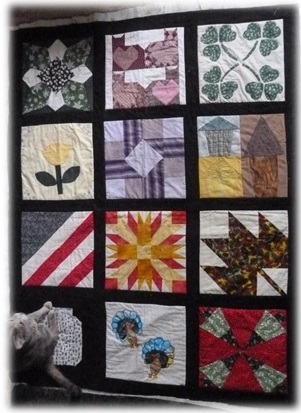 Blocks were chosen by members of the Quiltingboard, an online quilter’s group that I joined just before starting this project. This was my first Block of the Month (BOM) project, one of many I have done since. I love BOMs. 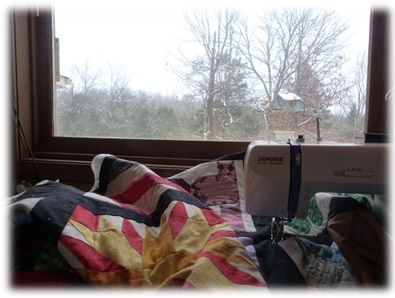 Having something to quilt every month keeps me at my sewing machine and always gives me something to look forward to. I admit that I was not really crazy about this quilt which is why it sat around for six years unfinished. But I am bound and determined to turn it into a pretty quilt. It took me all these years to decide what to do with it. I admit I never really liked it. It is too small to put on the bed. I was never crazy about all those colors. And I thought it was rather busy for my taste. Frankly, it is not my best work either. I now recognize that perfection isn’t what makes a quilt pretty. And there is nothing wrong with lots of color, since it is all tied together by the black sashing strips. After all, it does have a theme to it. So, I’ve decided to enjoy this project for what it is. Never mind the wonky sashing strips or the less-than-perfect points. I am happy with the knowledge that this was an early endeavor and I’ve honed my skills since then. This can still be a very pretty quilt, once it is completed. Quilt tops are hard to judge anyway, because the quilting is where the magic happens. How bad can this be? Bug, alias Junior, our little 3-legged cat seems to like it. Funny she picked the October block to sit on. I suppose that block was meant to represent canning food from the harvest, but I used fabric with tiny bugs on my jar. It reminded me of catching lightning bugs when I was a little girl. The more I think about this project, the happier I am to be finishing it. After all, it represents a few firsts for me. It was my first BOM. That first block for January used English paper-piecing, a technique I had never tried before. And this will be the first quilt I will free-motion quilt on my sewing machine that is bigger than a baby quilt. All of the others I have done have used the quilt-as-you-go method, whereby the blocks are quilted first and then sewn together to form the quilt. Because I’ve never worked on a whole quilt, I’m glad this is a small one. It will be good practice. I have another project waiting in the wings, a medallion quilt designed by Lynette Jennings previously mentioned in CHQuilts that I finished piecing last November. It is a Queen size quilt that I plan to free-motion quilt on my machine. new needle, as I always do before starting a new project, it started to snow. Today was a perfect day to begin working on this quilt. It marked the first time I touched my machine in 2018. I spray-basted the quilt top with its batting and backing fabric last week, so I was ready to start. Another first--I used my walking foot to stitch-in-the-ditch around each block and sashing strip. The quilt is now stabilized. So the fun is about to begin. Right now I have no idea what designs I will use in each block. I think I will figure that out as I go. I’m thinking I will use lots of colorful thread. I’m not afraid of color anymore. I’m getting a little excited. I think that despite the imperfections in this quilt, it is going to be pretty when it’s done.